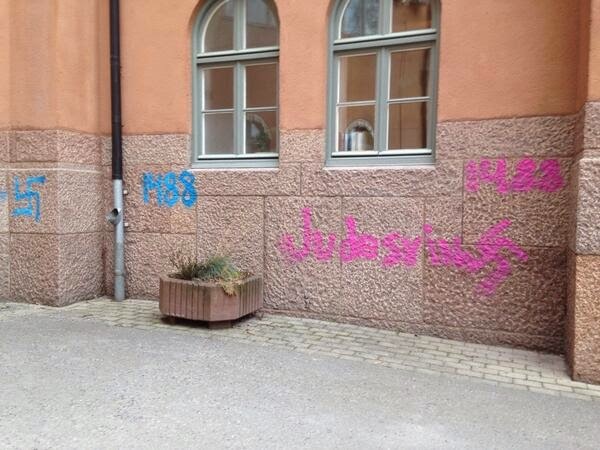 Anti-Semitic graffiti painted outside a Stockholm school. Whether in print or online, Sweden’s newspaper consumption ratio is one of the highest in the world. Technically considered a tabloid, Aftonbladet has the country’s biggest print circulation and was at the forefront of adopting Internet publishing. Despite the multitude of readers amongst the nation’s 9.5 million citizens, the daily’s journalistic standards have repeatedly come into question. In 2006, one of the paper’s own columnists criticized its emphasis on celebrity coverage rather than the war in Iraq. The memoir of world renowned moviemaker Ingmar Bergman accused Aftonbladet of deliberate character assassination. But Aftonbladet likes Muslim immigrants — can’t say enough good about them. Sweden sat out both world wars, selling iron ore to Germany, which one reason they are so prosperous (no post-war building was required for them — not that this means that any particular present-day Swede is sympathetic to Nazis, but it is worth keeping in mind).